The very popular family sitcom Who's the Boss? is returning to cable starting...today! 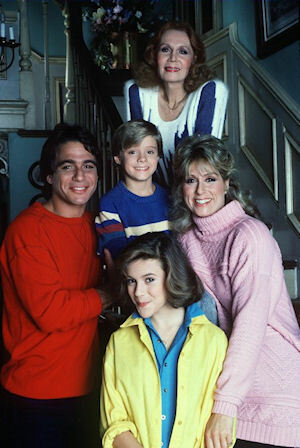 TV Guide Network has acquired the cable rights to the long-running 1984-1992 ABC sitcom starring Tony Danza, Judith Light, Alyssa Milano, Danny Pintauro and Katherine Helmond. The series will air back-to-back episodes at 6:00pm & 6:30pm starting tonight, Monday, July 2, 2012. It will also air at times at 1:00am when a movie doesn't run long, so check listings. The sitcom was last seen on cable on The Hallmark Channel for one year from May 2010 to April 2011. So, after little over a year the sitcom is back on television! The sitcom will follow back-to-back episodes of Designing Women at 5:00pm & 5:30pm, which remains in the hour. Who's the Boss? will lead into back-to-back episodes of Dharma & Greg at 7:00pm & 7:30pm for a nice block of comedy. Other comedies airing on the network are: more Designing Women (10:00am & 10:30am), Ugly Betty (1pm & 2pm), Samantha Who? (3:00pm), Ned & Stacey (3:30pm), Caroline in the City (4:00pm) and the return of Cybill (4:30pm). TV Guide Network is still also airing dramas Early Edition (11:00am) and The Guardian (12:00pm & 12:00am) on weekdays. Weeds (1:30am & 5am) and Curb Your Enthusiasm (4:00am) air sporadically. On the series, former professional athlete Tony Micelli (Tony Danza) and his daughter Samantha (Alyssa Milano) arrive at the upscale, suburban household of executive Angela Bower (Judith Light), where Tony has taken a job as live-in housekeeper. When they arrive, Angela is uptight and obsessed with her work. Her son Jonathan (Danny Pintauro) is shy and lacks self-esteem, and her mother, Mona (Katherine Helmond), is a man-hungry vixen. Tony eventually wins them over with his laid back style, and the Bowers soon begin to loosen up. FX's biggest night of comedy ever also proved to be one of cable's biggest nights of comedy ever as Anger Management set ratings records for a primetime scripted comedy series premiere, while Wilfred and Louie returned to the network with significant growth over their prior seasons, and FX's entry into the late night arena, BrandX with Russell Brand, got off to a strong start. Thursday, June 28 marked the most-watched Thursday night (prime, 8-11 PM) in FX's 18-year history in both Total Viewers (3.05 million) and Adults 18-49 (1.54 million). Thursday night's series debut of Anger Management (9:00 PM) was the most-watched primetime scripted comedy series premiere in cable history in delivery of Adults 18-49 (2.65 million, 2.1 A18-49 rating), and Total Viewers (5.47 million, excluding children's programming). It also ranks as the most-watched series premiere in FX history in Total Viewers. Episode 2 of Anger Management (9:30 PM) grew to 5.74 million Total Viewers, and the demo also grew in the second half hour to 2.89 million A18-49 (2.3 A18-49 rating). While the two episode premiere was the highest rated basic cable premiere for a comedy series, the BET premiere of The Game in January 2011 was might higher doing 7.68 million and a 3.6 A18-49 rating for its one-hour season premiere. So Anger Management didn't set a record for a original comedy on basic cable, it just did it for a series premiere. But this is still pretty good. Combined with the encore telecasts (1:00 and 1:30 AM), the series premiere episode of Anger Management delivered a total audience of 6.21 million viewers and 3.11 million Adults 18-49, and the second episode drew 6.45 million viewers and 3.29 million Adults 18-49. Episode 2 of Anger Management at (9:30 PM) ranked as the top-rated program on television (broadcast or cable) on Thursday in delivery of Adults 18-49 and Men 18-49, and in cable in delivery of Total Viewers, Adults 18-49, Adults 18-34 (1.24 million) and Adults 25-54 (3.22 million). The series premiere (9:00 PM) ranked #2 on television (broadcast or cable) on Thursday in delivery of Adults 18-49 and Men 18-49, and #2 among all cable programs Thursday night in Total Viewers, Adults 18-49, Adults 18-34, and Adults 25-54. Anger Management moves to its regularly scheduled time period of Thursdays at 9:30 PM ET/PT beginning this week: Thursday. July ). FX will repeat its pilot and second episode also this Thursday at 8:30PM and 9:00PM, respectively. Labels: Anger Management, Designing Women, FX, TV Guide Network, Who's the Boss?